We frequently visit and review the UK’s leading schools, as part of our Education Consultancy service. 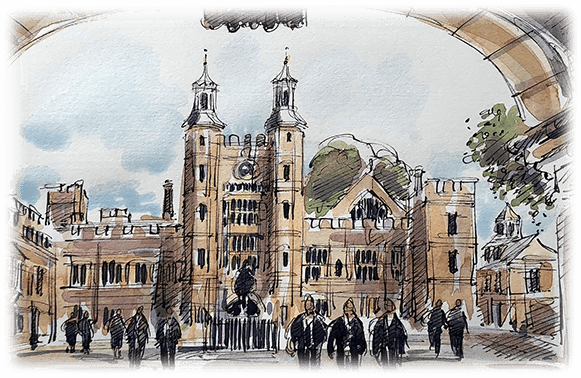 In this article, we recount our visit to Queen’s Gate senior school, an independent day school for girls aged 11 to 18 in South Kensington, London. If you are interested in sending your daughter to Queen’s Gate, please contact one of our education consultants today or use our online enquiry form further down this page. Queen’s Gate senior school is set across three Victorian townhouses on Queen’s Gate, South Kensington, with its junior counterpart only a stone’s throw away. Behind this elegant façade, Queen’s Gate has a welcoming and friendly atmosphere. There is no set uniform, though the girls are expected to adhere to a dress code. Despite the limited space, there are roof terraces for years 7, 8 and 9. The Sixth Form can leave and take breaks in many local cafes dotted around South Kensington. Despite being relatively small with just over 500 pupils, the school is incredibly diverse, reflecting London’s international culture. With so many different native speakers, the school celebrates different languages and gives the girls the opportunity to study multiple languages, including Mandarin, from Year 6 onwards. Queen’s Gate is recognised as an academic higher flier. 90% of Queen’s Gate’s girls go to their first-choice universities, securing places at top institution including Oxford, Cambridge, Imperial, UCL, Durham and King’s College London. The school also sees many of the pupils cross the pond, with recent alumni attending NYU, Princeton and Boston. Though an academic high flier, Queen’s Gate cultivates the ‘all-rounder’. The Principal, Rosalynd Kamayrc, aims to emphasises the importance of success across the board and outside of the classroom. Art and Drama are a key focus of the curriculum at the schools with the V&A on their doorstep for inspiration. Sports also play a key role and the girls can choose from anything from rock climbing and biathlon training to squash and fencing. The school can also use many of Imperial College’s facilities thanks to their close relationship with the university and curricular PE lessons often take place at The Queen’s Club and in Battersea Park. Although Queen’s Gate lacks the degree of scale and high ambition of some of its local competition, it is foremost a happy and culturally rich school. It takes pride in each of its well-grounded and well-rounded pupils, and makes for a welcoming and engaging environment in which young girls can thrive. To learn more about Queen’s Gate School and to find out whether this is the right school for your child, please call one of our education consultants today.